Being trapped in a room with nothing to free yourself but your own brain power is enough of a quandary; it becomes the surreal stuffing of an inflated bad dream when, upon exiting one door, you discover not freedom but yet another door. But this scenario, quintessentially appropriate in 58 Works' DOOORS 2, has exactly what fans of the 100 doors style of mobile room escape games appreciate the most: ongoing, increasingly challenging gameplay that's easy to pick up and just play! Following the exact format that 58 Works made popular in DOOORS, the sequel asks you to do one thing—open the door. Initially, it's as simple as it sounds yet, as you progress through the stages (there are 40 at the time of writing), puzzle success requires more lateral thinking as well as agility and dexterity. You'll need to tap, pinch and slide, uncovering and using helpful objects, putting together hints to master a code or tilting your mobile device just so until the door is unlocked and ready to pass through. There are times DOOORS 2's puzzles seem standard and rote, in a subgenre that has perhaps reached its peak in variations on theme, yet it does have a smattering of unique presentations and some refreshing effects. Plus the design is exceedingly high quality, just as you'd expect from the developer responsible for such escaping favorites as Garou and Kalaquli. Most levels are rarely difficult to solve although the game is not without challenge. There's one stage in particular requiring acrobatic feats with your device that might leave you frustrated. If you do wind up stuck and uncertain how to progress, observation coupled with experimentation should eventually provide the answer. Most of all, DOOORS 2 serves its purpose very well, opening the door to short or long bursts of puzzling amusement on the go. NOTE: This game was played and reviewed on the iPhone 4S. Game was available in the North American market at the time of publication, but may not be available in other territories. Please see individual app market pages for purchasing info. DOOORS 2 Walkthrough now available! 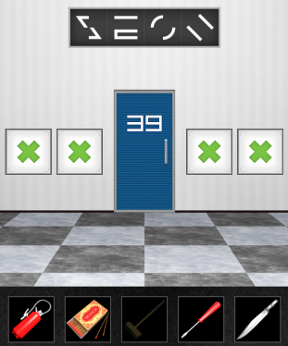 Take the key from the lower right corner of the screen (tap it), then use it to unlock the door. Take the two green blocks and insert them in the holes indicated by the picture above the door. You can then open the door. Slide the door to the left. Open the right hatch for a screwdriver, then open the left hatch, unscrew the screws, and hit the button behind the panel to unlock the door. Tilt your iPhone to the right to slide the door open. Slide the first pane of glass to the left (all the way), then the second pane to the right (all the way). With each one, a light above the door should turn green, and when they're both green, the door is unlocked. Open it by sliding it up. Tilt your iPhone left and right to reveal a four-digit combination above the door. Copy it to the panels to the left and right of the door; each digit should be represented by the number of green rectangles there. Then open. Open the door when the green light is at the arrow. As for the ghost, retrieve the cross from the box and use it. Make the levers slant diagonally to match the areas of the same color on the door. When they're both right, the door can be opened. Tap the little drawing on the right edge of the screen to look at it. Following the spiral, slide the door left, up, right, right, down, down, left, left. This one reminds me of something I saw on one of 58Works's online games. Slide the slider on the left up and down, stopping at each extreme, until the skull's jaws don't open any further. Take the fire extinguisher and do what's obvious with it. Color wheel on the left, hatch with buttons on the right. Set the buttons to match their corresponding positions on the color wheel: cyan (x3), gray (x4), red (x1). Unlocked. Reverse-pinch the door open vertically, just as the drawing above shows. Tilt your iPhone left and right until you can spot the red ball behind the yellow ball. (Tilt sharply.) Take it and slot it into the left rabbit's missing eye. Take the stick behind the leftmost cactus and use it to press the button on the ceiling. Then, press the four buttons in the order the cacti indicate: second from left, rightmost, leftmost, second from right. First, examine the metal latches holding the door shut and unscrew them. Then, press the buttons below the golden balls to jump them. Press them almost simultaneously so they're both above the green line at the same time, then open the door. Take the broom, equip it, and swipe across the floor to clean it until you reveal four symbols. Copy those symbols to the panels above, then open the door. Huh?! The room's upside-down! Hold your iPhone upside-down and the door will unlock. Some sort of standoff. Put the cross in the white centaur's hands to unlock the door. Two of the tiles, the ones the white triangles are pointing to, can be looked under. Take the goggles from under one and use them to look underwater. Down there, use the broom to clean the wall, and note the shape of the fish skeleton. Touch the six buttons up above to mimic that shape, and the door will be unlocked. Move the plants out of the way with repeated taps to reveal an arrow. Swipe the door to the right with two fingers to open it. Clear the smoke by tapping and holding a finger on the valve it's coming from. Change the lower-left circle to purple (1) and the lower right one to cyan (6). Slide the gates open. Tilt your iPhone until the green squares are centered in the red outlines, then carefully open the door. Insert the stick (the one that looks like a lever) in the thing on the right, then pull it. Watch what the circles hanging above do. That's a four-digit combination. The leftmost circle is 1, the one beside it is 2, and so on to the right. Input that combination on the panels and open the door. Tilt your iPhone to dump the green ball in its bottom-most spot, but NOT the red one. The trick is to use momentum to send the green ball over the edge while keeping the red one safe. If you mess up, drop both balls, then press the button to reset them. Use the broom to dust off the walls, revealing a panda and a turtle. Where do those animals live? Press the buttons until the green lights are on southeast Asia and Ecuador (the latter is just to the left of the upper part of South America). You can then open the door. Slide the right panel up to get a box of matches. Slide the left panel down to reveal a strange code. Light (matches) and extinguish (fire extinguisher) the candles to match those patterns on the pentagon; a light should turn green with each one. Then open the door. Zoom in on the cocktail shaker, then shake your iPhone until you hear the door unlock. This is room 29. You can't interact with anything if there's green gas covering it, so tilt your iPhone left and right to slide a cover to wherever it needs to be. Set the left panel to "2-backwards-2" and the right panel to "9-backwards-9" to unlock the door. Tap the trampoline to get air. Turn on five lights in an X shape to unlock the door. One of the barrels on the right has a notch on the lid; use the screwdriver to open it. Dive in with the goggles and take the knife. Use the knife to cut the rope on the left, then apply the fire extinguisher to the little problem beyond the door. It's the man from the first game! Rotate your iPhone the way he swings; if it doesn't work, try the other directions. The petals on the flower above the door should turn green as you do so. Use two fingers to hold the buttons beside the door while you use a third finger to open it. Slide the panels in from the left and right, and unscrew the screws on the screwed panel. Figure out what the added and subtracted shapes are (don't think mathematically, think in terms of positive and negative space), and set those shapes on the appropriate sides. Tilt your iPhone left and right to move the panels. Set the circles the colors their counterparts are on the door. From left to right: gray, gray, black, white, black. That looks like your inventory, doesn't it? Weigh the fire extinguisher and the knife on the scale, and set the corresponding dials to what the scale read. Turn off the lights (the switch is near the lower left corner) and watch the circles change color. Set the number of white segments in each circle to the number of blocks in the corresponding shapes on the table: yellow 5, blue 8, green 6, red 3. Jam the cogwheel with the broom. Behind the left and right panels, turn the wheels to form unbroken connections between the left and right sides. Tilt your iPhone up, then left and right, and watch the green and white shapes overlap. They should click in place when they assemble to form a sensible-looking arrangement of shapes. Copy those shapes to the four panels. Slide the glass to the right and cut the ropes with the knife. Unscrew the screws holding the flammable jug, tip it over, and use the matches to set the puddle on fire. Extinguish the fire with the extinguisher and open the door. One man on the left, several men on the right. Four continental flags. The order is: vertical stripes, horizontal stripes, American flag, stars. Tilt your iPhone left and right to reveal the hole behind the door. Tap the wooden plank to reveal what's behind it. Sliding your finger in a circle? Do exactly that, following the ring around the door, until it's open. Take the basin and press the button underneath it to turn on a purple light, then tilt your iPhone left and right to reveal shapes on the walls. Copy those shapes to the buttons and open the door. Weird lamps. Swipe left with one finger, then with two fingers, then with three fingers. The door's not locked. Set four switches upwards to make an X shape. When the rocket pops up, light it with the matches; try to hit the moving white button. Two hits will unlock the door. Weigh down the buttons with the rock and the fire extinguisher. Shake your iPhone to wake up the eyes, then rush through the door before it closes. Three of the things on the table fly, three swim. Set the levers to match: up-down-up-up-down-down. Hold your iPhone upside-down (or just tilt it forwards) to reveal the message. Subtract the indicated segments; the code is 3151. You should know how to input that in the familiar rectangles. Rainbow! Set the squares to red-orange-yellow-green-light blue-dark blue-purple to get a crowbar, then use it on the drain. Go down to reach the thankfully-unlocked door. Green means go; red means stop. Stop the counter on 51 to unlock the door. Don't expect to do it on your first try. "5"? Unscrew the screw on the thing on the floor and it's free to slide, but to what end? Tilt up, down, left, and right to make it hit all five light bulbs; that'll unlock the door. Use the crowbar on the floor tiles to reveal some weird double hands. Match the number of fingers out on the six-slice wheels to unlock the door. Get the smoke generator out of the way by sliding it. Push the arrow buttons to get the green square to the red area, and the door will unlock. The red ball slides fastest, then green, then yellow, then blue. Note the images at the top corners. Set the circles to blue-yellow-green-red. Behind the door, cut the caution tape with the knife. I think I know whose sandals those are. Slide him out from under the car, and examine the card in his hands. Set the six dials in that configuration to unlock the door. Disco ball! Rotate the circles on the right to complete the line, then set the circles on the left to match the colored lights and their heights: green, orange, red, purple, blue. That'll unlock the door. Remove the panel on the left with the crowbar, then reverse-pinch the hatch open. Equip the remote; use the up and down buttons to aim the turret's cannon, and the red button to fire. Shoot out all three light bulbs to unlock the door. Fill the basin with water, then pour it into the hole in the floor and take the knob. Put it and the screwdriver into the appropriate holes, according to the coordinates in the upper corners; when they're both right, the door will be unlocked. Those designs above the hallways look vaguely like numbers, don't they? Go through the hallways 1-2-3-4-5 to reach the end, then open the door right when the green meters are above the line. It's easier said than done. 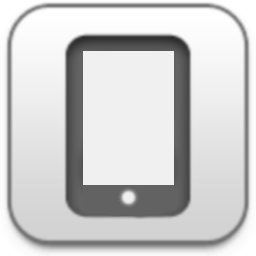 You put "iPad" in the tags but it isn't really an iPad game, only in the sense that you technically can play any iPhone game on your iPad but it just looks really ugly and blown up. But it's not a universal app. Thanks for pointing this out, Alex. I've corrected the review. Fun just like its predecessor. The last one went to 80 levels; I wonder if they will add more to this one.